A new 100 ruble banknote. Crimean scenes feature on new Russian banknotes. 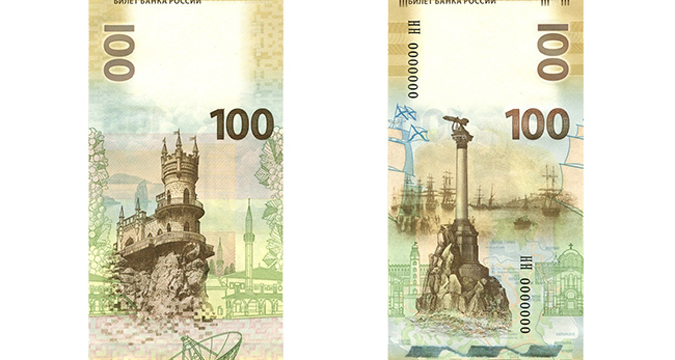 The Bank of Russia has issued a new 100 ruble ($1.40) banknote featuring images of Crimea. The peninsula's famous fantasy castle, The Swallow's Nest, is depicted on the title side of the note. The other side shows a detail from Ivan Aivazovsky's famous 19th century naval painting "Russian squadron on the raid of Sevastopol". The idea for the new banknote was first aired in Russia's parliament last summer by Duma deputy Alexey Didienko. Central Bank head Elvira Nabiullina did not make any firm commitment at the time but promised to look into the idea, Izvestia reports.